Attack on Titan has done some truly gnarly things during its tenure. 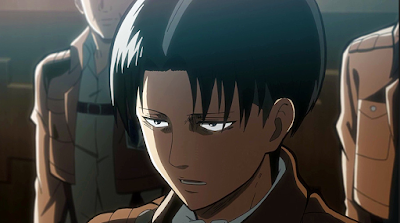 The series has become well-known for its gruesome deaths, and Captain Levi has brought about plenty of them. However, no one expected the soldier to go as far as he did in Attack on Titan’s latest update. Not long ago, the series published its new chapter, and Attack on Titan did not hold back. The update saw Levi face his most dangerous battle yet as he found himself in the midst of a Titan swarm. Thanks to a clever plan, Zeke was able to turn all of Levi’s squad into mindless Titans, but the soldier did kill them all. Chapter 113 ends with Zeke in bad shape after Levi takes the shifter down. He wakes up on a cart moving to an unknown place, and he realizes quickly that he’s about to die a real painful death. After all, he has been impaled, and Levi was kind enough to explain how far he went to make Zeke suffer. The thunder spear’s fuse is connected to a wire that’s been tied around your neck. If you move recklessly, it’ll detonate from your abdomen. You’ll probably end up in two pieces to say the least where Continuing, Levi goes full sadist when he decides to take out some anger on Zeke. The soldier tells the traitor he doesn’t feel any sympathy for what he’s done given how Levi had to just kill his men because of Zeke. Levi takes this moment to ensure Zeke cannot heal enough to turn into a Titan out of nowhere, so the captain decides to cut off the shifter’s feet and legs piece by piece. The brutal scene leads Zeke into a flashback that ends the chapter, giving readers the slightest reprieve. Right now, things do not look good for the Marley native, and Levi seems ready to do whatever it takes to ensure Zeke dies the worst kind of death. So, as it stands, fans shouldn't be surprised if things only get worse for the shifter before he gets killed.